How’s your Mercedes running? Have you noticed any issues that may not have been there when you first purchased the vehicle? Unfortunately, even though Mercedes are luxury import vehicles, they will experience mechanical issues just like other cars. At Kudos Import and Performance, we want all of our Chesterfield area clients to be as knowledgeable as possible when it comes to issues that may affect their Mercedes. 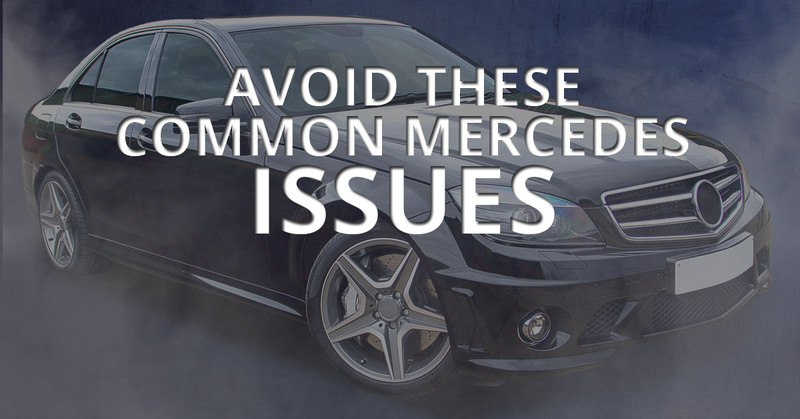 To help with this, in today’s post we are going to list some of the most common issues that Mercedes Benz owners have to deal with, and what you should do if your Mercedes starts to experience said issues. We hope that after reading this blog you are able to identify issues before they become major problems, helping you save money on Mercedes repair costs. While German engineers are know the world over for their amazing skills, even they cannot make a vehicle that does not need repairs at some point during its lifespan. Mercedes, while meticulously engineered, will still experience issues that need to be looked at by a professional. Below, we have listed a few of these issues. Startup Rattle: Some Mercedes owners will notice a rattling sound for about 20 seconds when they start their vehicle. This is particularly common when it is colder outside and can become quite alarming for those who don’t know what it is. Typically, this issue is caused by a belt tensioner that has become worn out or a faulty water pump pulley. Either way, if this issue is left unchecked, it could cause your Mercedes to overheat or leave you stranded with a broken belt. Rear Suspension Rattle: Continuing with the theme of mysterious rattling noises, some Mercedes Benz owners have reported that they sometimes hear a rattling noise coming from the rear of their vehicle. While a rattling noise could be caused by many things, most commonly this issue is caused by a break in the lower portion of the rear suspension spring. When the spring breaks, the broken pieces collect in the rear spring pocket and, as you drive, they rattle around. This issue needs to be addressed as soon as possible because having a broken suspension spring is never a good thing. Ignition Won’t Turn: This issue can be very frustrating for a number of reasons. For some Mercedes Benz owners, they will go to turn the ignition in their vehicle only to find that, while the key will go into the ignition barrel, it will not turn. This particular Mercedes repair is usually caused by a failure of the EIS (electronic ignition switch) module. Usually, Mercedes owners can avoid a complete failure because they will at first notice that the key is difficult to turn. If you’re Mercedes is equipped with an EIS module and you are having difficulty getting it to turn, please come see us at Kudos Import and Performance so that we can replace it before it fully fails. If you feel that your Mercedes may be in need of repair or you simply want to schedule a maintenance check, please contact us today at Kudos Import and Performance. We are dedicated to providing the best import auto maintenance and repair services in the Chesterfield area.